What’s the best way to describe Shuggie Otis? A musical virtuoso. So is vastly underrated. That’s a good start. Certainly Shuggie was something of a child prodigy. He first playing the guitar aged two, and was playing with his father Johnny’s band from the age of twelve. As if that wasn’t impressive enough, Shuggie released his debut solo album aged seventeen. It’s certainly no exaggeration to call Shuggie a musical virtuoso.Not once you’ve heard him play guitar. Then you’ll realise that’s almost an understatement. It’s not just guitar he plays. No. He’s a true multi-instrumentalist. Shuggie can play bass, drums, organ and piano. Sadly, despite Shuggie’s music is vastly underrated, partly because as yet, he’s still not made a commercial breakthrough. The music he makes is best described as a fusion of R&B, soul, funk, jazz, rock and blues, which when combined, sounds quite incredible. 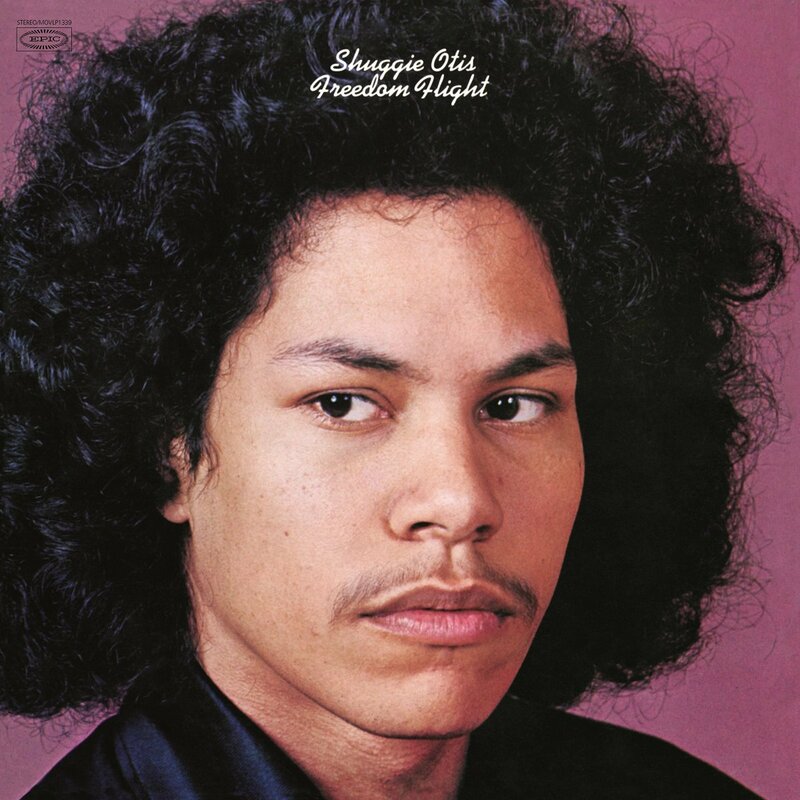 Back in 1971, aged just nineteen, Shuggie released his second album, Freedom Flight the follow-up to 1969s Here Comes Shuggie Otis. Among the musicians accompanying Shuggie on Freedom Flight are keyboard player George Duke, drummer Aynsley Dunbar, bassist Wilton Felder and Johnny Otis, Shuggie’s father. Johnny played drums, piano and tambourine, as well as singing backing vocals. Together with Shuggie and the rest of his band, seven tracks were recorded, which became Freedom Flight. Of the seven tracks on the album, Shuggie wrote four, and cowrote two others. Probably the best known track from Freedom Flight is Strawberry Letter 23, which was later covered by The Brothers Johnson in 1977. Their version was produced by Quincy Jones and reached number five in the US Billboard 100 and number one on the US R&B Charts. This eclipsed the success of both Shuggie’s original version of Strawberry Letter 23, which entered the US Billboard 100, but didn’t scale the heights of The Brothers Johnson’s version. On Freedom Flight’s release in September 1971, it reached number twenty-three in the US Billboard 200, becoming Shuggie’s most successful album. Sadly, this was as close as Shuggie’s music got to being a commercial success. Three years after the release of Freedom Flight, came the release of Inspiration Information in October 1974. This was the last solo album Shuggie released, reaching number 181 in the US Billboard 200 and number fifty-six in the US R&B Charts. Again, commercial success eluded Shuggie, and after this no further albums by Shuggie were release. However, by the nineties interest in his music was growing, with Shuggie gaining a cult following. This was helped by artists like Lenny Kravitz and Prince praising his music. Since then, all of Shuggie’s albums have been rereleased, including Freedom Flight, which will be released by Music On Vinyl on 27th April 2015. Freedom Flight which I’ll now tell you about, features the musical coming of age, of from the nineteen year old Shuggie Otis. Freedom Flight opens with Ice Cold Daydream, one of the four tracks written by Shuggie. With wah-wah guitars and rhythm section and organ combining elements of funk with soul, R&B and blues, the track literally bursts into life. As Shuggie’s vocal enters, it’s noticeable that his voice has a soft, youthful sound, that’s a contrast to much more powerful arrangement that’s unfolding behind him. Meanwhile, behind him, the arrangement is fast, with a fuller sound. Searing, soaring, rock guitars compete with the rhythm section and organ for your attention. However, it’s Shuggie that wins the day, demonstrating his virtuoso skills as a guitarist, dominating the sound and stealing the show from a group of much more experienced and seasoned musicians. Quite simply, it’s an astonishing display of guitar playing from a nineteen year old, who plays like a veteran. Strawberry Letter 23 is by far, the best known track on Freedom Flight. As good as The Brother Johnson’s version was, this is quite simply the definitive version of this beautiful slice of sunshine pop. It’s almost impossible not to feel uplifted after hearing this track. It’s four minutes of pop perfection, and very different from the opening track. It’s easily the best track on Freedom Flight. A piano, percussion, guitar and rhythm section combine with Shuggie’s emotive, thoughtful vocal as the song meanders along beautifully. Backing vocalists accompany Shuggie’s subtle vocal, while percussion and acoustic guitar combine. After two minutes twenty seconds, the sound changes, filters are used to blur the sound when guitars chime and sear, climbing and climbing, repeating same notes. They combine with understated, lilting backing vocalists and this glorious combination continues for over a minute, until the song’s dramatic climax. It’s pop perfection . Sweet Thang sees another change in sound and style. Shuggie combines with his band to create a real rootsy, bluesy sound. It’s a combination of soaring, chiming guitars, piano, wailing Hammond organ and rhythm section. During the track, there’s some stunning guitar and piano playing, with occasional haunting backing vocals. Add to this the atmospheric sound of the Hammond organ and some exotic sounding percussion and the result is a very different sounding track to Strawberry Letter 23, but one that demonstrates Shuggie’s versatility and talent. The only track on Freedom Flight not written or co-written by Shuggie is Me and My Woman, which was written by Gene Barge. It closes side one of the album. Again, there’s a bluesy sound to the track, with Shuggie’s chiming guitar accompanied by flourishes of piano and rhythm section, before a similarly bluesy vocal from Shuggie. It’s an irresistible sounding track, one where Shuggie’s voice sounds stronger and much more mature. Driven along by the rhythm section and guitar, and augmented by the subtle piano, Shuggie’s talent shines through, contributing slick licks aplenty on this authentic sounding electric blues track. Side two of Freedom Flight opens with Someone’s Always Singing a slow, moody sounding track, where a distant, wailing Hammond organ, slow rhythm section and searing guitar accompany Shuggie. It’s a very different sounding track from its predecessors. There’sa slight gospel influence, thanks to the backing vocalists. Mostly though, it’s just Shuggie’s soaring, chiming guitar combining with the Hammond organ, percussion and rhythm section. The track sees Shuggie the free spirit wanting to live “from day to day,” without ties nor commitments. However, it’s a slightly disappointing track, not up to the standards of its predecessors. It almost lacks a musical direction. Indeed, it almost has an unfinished sound, with an arrangement that’s neither as full for good as its predecessors. Purple sees the quality return on a slow, bluesy sounding track. Here, Shuggie’s crystalline guitar, chimes and sears, as the rhythm section combine to play a shuffling blues. Augmenting the sound are piano and atmospheric sounding Hammond organ. However, like other tracks, Shuggie’s guitar playing takes centre-stage. It has an almost mesmerizing sound, as the track chugs along. Adding to the authenticity of the bluesy sound, is a stunning harmonica solo, which almost competes with Shuggie’s guitar playing. This adds to the track’s slightly dramatic sound. Later, the Shuggie plays bass and show-cases his versatility, before returning to guitar for the rest of track’s seven minute blues epic. Freedom Flight closes with the album’s epic title track Freedom Flight. It’s just Shuggie’s guitar that opens the album, his fingers nimbly meandering up and down the fretboard. After nearly two minutes, dramatic drums, crashing cymbals and a wailing saxophone combine with Shuggie. Together, they combine to create a sound that has almost a free jazz sound. Eventually, Shuggie and his band come together for a prolonged jam lasting twelve memorable minutes. The track has a much fuller yet, spacious sound. For the remainder of the track, a rasping, wailing, soaring saxophone, keyboards and percussion, combine with the rhythm section and of course, Shuggie’s masterful guitar playing. Having vied with the saxophone for prominence, Shuggie’s guitar goes on to dominate the track, chiming, searing and soaring until the end of this absolutely magical, epic track that closes the album. Although Shuggie was just nineteen when he released Freedom Flight, it was a really mature sounding album, that combined a variety of styles. From blues to R&B and rock to jazz, funk and sunshine pop there’s a bit of everything on the album. With just seven tracks, lasting only thirty-nine minutes Shuggie Otis, musical virtuoso, takes you on a tour of musical styles and his musical influences. Not only does he play guitar, but plays bass and organ. However, it’s his guitar playing that dominates Freedom Flight. That’s no bad thing. Shuggie Otis is one of the most underrated guitarists of his generation. Too often, the word virtuoso is overused, but when applied to Shuggie Otis this title is fully deserved. He truly is a guitar virtuoso, playing every note with passion, seamlessly bringing the music to life. Apart from Someone’s Always Singing, which is a slightly disappointing track, the other six tracks feature some of the music music Shuggie Otis recorded. The highlight of Freedom Flight is Strawberry Letter 23, a slice of sunshine pop with a twist. On Strawberry Letter 23, Shuggie Otis and his all-star band reach new heights. It’s a joy to behold, and a reason why every record collection should contain a Shuggie Otis album. If you don’t own a Shuggie Otis album, then you’ve let you to experience one of music’s best kept secrets. That’s no exaggeration. The publicity shy son of Johnny Otis is one of the most underrated musicians of his generation. Shuggie Otis for whatever reason, never seemed to want ti reach the heights his contemporaries did. Instead, he recorded a trio of albums, and disappeared for over thirty years. However, for the last ten years, there’s been a resurgence in interest in Shuggie Otis’ music. Sadly, still, however, many people haven’t heard Shuggie Otis’s music. If you’ve let to hear the wonderful music of Shuggie Otis, then you’re very definitely in for a treat. Freedom Flight, which will be released by Music On Vinyl on 27th April 2015, features some of the best music Shuggie Otis ever recorded, and is without doubt, the perfect introduction to a true musical virtuoso.